Why rely on a friend or untrained pet sitter to take care of your pet when you go on vacation or travel for business? Pennington Animal Hospital can provide affordable, safe and comfortable lodging for your cat or dog while you're away. Your pet is always welcome at our spacious indoor boarding facility. We offer climate-controlled kennels with plenty of room for your dog or cat to stretch out so they have a comfortable home away from home. While staying with us, your pet receives plenty of love and attention from our caring staff, as well as frequent walks and play time. Your pet's special health needs, such as medicine administration, food preparation and exercise, will all be reviewed with you. You are encouraged to bring your own food if your pet is on a special diet. Toys and personal items are also welcome to help make your pet as comfortable as possible. For your convenience, we offer after hours pick-ups and drop-offs on holidays and weekends at specified times. We also provide a bath and nail trim at your request. For our patients who have chronic or acute medical conditions that require a caregiver with veterinary knowledge and experience, we also offer specialized medical boarding. Your pet's stay with us includes careful supervision by our experienced medical team, administration of any needed medication and daily exercise in accordance with your pet's specific needs. Proof of current vaccinations are required. In order to provide better protection for your pet, all vaccinations should be given at least 10 days prior to boarding. Grooming is more than a bit of pet pampering — it's an important part of wellness care. On some pets, nails curve around and grow into the feet, causing pain and infection. Regular trimming is an excellent alternative to declawing and reupholstering your couch. Regular baths for your dog or cat at Pennington Animal Hospital can assist in the detection of skin infections and growths before they become a problem — not to mention make your pet look, smell and feel better. 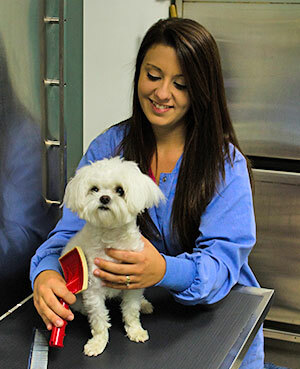 For more comprehensive grooming, we will refer you to an experienced and certified local groomer. For more information about the boarding or grooming services Pennington Animal Hospital offers for your Huntsville pet, please call 256.883.4148.